This website, hosted by Disney, is IT at our house these days. 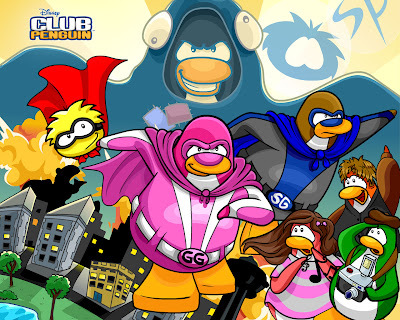 Trevor, Logan and Lizzie all have their own account and penguin. They spend a lot of time (almost every day) on the computer chatting, playing games and collecting items for their penguin characters. Parents, do not fear, this is a very safe environment for kids to stop by and have a little fun. No personal information is allowed to be shared and if you do you will be removed from the system. So, yes, it is SAFE. They love to run next door and tell their cousins to log on and then run home to chat online with them. My kids love this site too!! Not yet they don't! I bet they'd love it though, I'll have to check it out.